The current challenging economic times is a good time for reflection and we should not waste the opportunity to take stock of where we are heading as a people and a nation. Going by the adage that life begins at 50, Malaysia is still a fairly young nation and adopting more inclusive policies that mobilise the country's rich human and natural resources will be able to cushion the country from any adverse external shocks. Reading about Bhutan and how its much-beloved king places great value on the wellbeing and happiness of his people by inventing the Gross National Happiness index is very inspiring indeed. The fact that the people's happiness is listed as the top priority speaks volume of how much they are appreciated as individuals. Other inspiring aspects that we can take a leaf from include the emphasis on preserving the natural environment and promoting simple and non-intrusive way of living. Despite a deliberate policy to limit the number of tourists allowed to visit Bhutan, an increasing number of tourists are finding their way to Bhutan for its natural beauty and simple way of life. Their simple way of lifestyle means one can get by with less and there is less pressure to chase material wealth. In its place is the emphasis on personal virtues and wholesome values of integrity, honesty, generosity and empathy for other people. I believe the promoting of such values will set the foundation for wholesome community and nation building for our country. The Bhutan story must have prompted many of us to start reflecting on our journey of life, and how we have fared in terms of the happiness index. Come to think of it, since the world economy is on the verge of a double-dip scenario and there will be very low or no growth in most nations, some tweaking in national policies and priorities may be what Malaysia needs to see our country and the people through the challenging times. It may be a good idea for us to draw up a Malaysian Happiness Index to measure how our people are faring against the rest of the world. In the fast changing world we live in today, the elements that contribute to our happiness are constantly changing but there are some evergreen or “true blue” ones that will remain come what may. The list may include whether the people have a roof over their head; the cost of living and how much does it take for a family to get by on a daily basis; freedom of expression and to pursue one's interest; and ability for the people to keep safe and thrive in their society. Recent events around the world have shown that social disparity is still a huge problem in both the developed and developing countries, and can become a source of social discord and public unrest. In the face of the high cost of living and inflated property prices, one of the immediate tasks of the Government is to pay more attention to social or public housing, and ensure that people have a roof over their heads. Providing the less-endowed populace with some basic necessities such as a home of their own is tantamount to offering them hope for a better tomorrow. Even China is counting on its massive effort to build low-priced social housing for the low-income group to provide enough demand to sustain its real-estate market from collapsing. It has set a target to build 36 million subsidised housing by 2015. In Malaysia's case, the need for concerted efforts to build adequate public infrastructure and housing cannot be over-emphasised as the ongoing efforts are still quite fragmented. Instead of involving so many agencies in the execution process, having a dedicated agency as the master planner to oversee the overall planning and execution of the projects will ensure a higher rate of success to benefit more people. Providing enough public housing and other social amenities should be accorded one of the top priorities along with the other economic-based initiatives under the government's Economic Transformation Programme. The sharp increase in prices of goods and services, including that of property, meant people have less disposable income and spending power. These projects will be able to wipe out the many squatters and slumps, and rejuvenate our cities. Focusing on public housing can also provide a cushion for the property market from stagnating during troubling economic times. Deputy news editor Angie Ng hopes improving the Malaysian Happiness Index will be the basis for all nation building policies and initiatives going forward. KUALA Lumpur City Hall will set up a redemption reserve account to buy up public housing units of loan defaulters after the sixth month. The loans are arranged through the special housing scheme financed by the Employees Provident Fund (EPF). This scheme will be managed by Syarikat Perumahan Wilayah Persekutuan established under the Federal Territories Foundation. Federal Territories and Urban Wellbeing Minister Datuk Raja Nong Chik Raja Zainal Abidin said 20% from the sale of all public housing units would be channelled into the account and not be used for other purposes. “Profit rate charged by EPF is 5.5%. DBKL guarantees on buying back the units from the defaulters to sell it back to the 27,000 other eligible applicants in the waiting list. “The value of each unit is double the cost so I hope the current tenants would take the opportunity to buy these units. “I would also like to remind the buyers to be responsible and service their loans or risk having their units taken away,” he said. Nong Chik said all the current tenants who had been paying rental on time were automatically eligible for this scheme. “It is a good scheme for the lower-income group with no down payment required and 100% loan with a repayment period up to 25 years. “I encourage every one to take it up because it might just be the only asset for many. “The units bought can be rented to local residents or sold after seven years of settling the loan,” he said. Starting from March, DBKL would be having roadshows to explain to potential buyers on the scheme. So far, there are 44,146 public housing units for sale of which 4,919 have been sold. Another 12,675 have agreed to accept the offer. Each unit costs between RM21,500 and RM35,000. Monthly instalments would be between RM200 and RM300 a month. KUALA LUMPUR: Faber Tower, which was built by Faber Group Bhd in 1986, is up for sale for RM80 million to RM90 million, people familiar with the matter said. marketing agent. The rest of the complex is held by individual owners. Sources close to Jeram said the company is looking to cash out its share in the complex, which it acquired from Faber in 2004, to focus on other ventures. Faber had entered into a conditional sale and purchase agreement with Jeram, a special purpose vehicle set up by a consortium of banks, to dispose of properties, including hotels and a mall owned by the group as part of its debtrestructuring exercise in May 2004. The complex comprises two 18- to 20-storey office blocks, a podium and three-level carpark and Jeram is selling 610,000 sq ft of floor area. Jeram is selling 22 strata office units or 81.4 per cent of Tower 1, and the whole of Tower 2. Also for sale are 62 strata retail units or 73.6 per cent of the podium, and the carpark. Property experts said Jeram is selling the properties below market price. As at December 31 2002, the net book value of the complex sprawled over 2.63 acres was RM105.12 million. He said commercial land surrounding the complex is currently selling for between RM400 per sq ft and RM500 per sq ft. It is understood WTW has been approached by investors from Malaysia and Singapore. After some dithering, the construction of the My Rapid Transit (MRT) project is moving into higher gear. The two major contracts awarded by MRT Co last week that totalled some RMl.6bil is proof that things are moving. What's to come is more telling. By April, MRT Co, the overseer and project owner of the country's largest ever infrastructure project, would have awarded a total of around 90 or so projects. The figure of these contracts run into billions and would clearly be a major boost to the construction and related sectors. The multiplier effect on the economy will soon be felt. “We have been waiting for this, as these projects have already been earmarked by the Government before. The industry and the country need these projects to spur economic growth, in light of the gloomy global scene. The multiplier effects are well spelt out,” says Master Builders Association Malaysia (MBAM) president Kwan Foh-Kwai. While research houses have yet to make an outright bullish call on the construction and related sectors, there are hints that a re-rating is in the offing. Among the larger contracts that are being dished out are for elevated civil works that entail the building of viaduct guideways and other associated works. 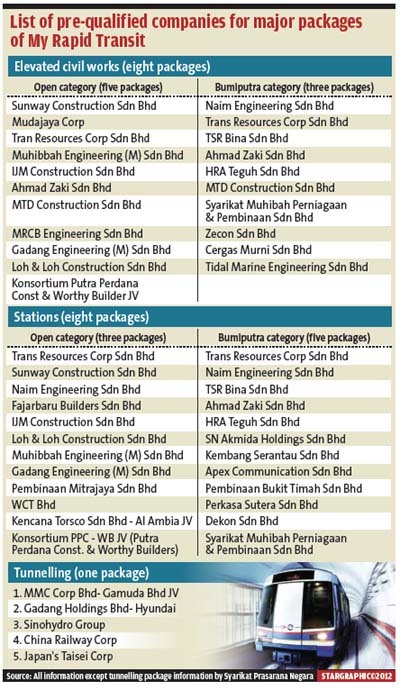 There are eight of these packages, each averaging RM500mil, according to MRT Co. However, the two that have already been awarded recently to IJM Corp Bhd and Ahmad Zaki Resources Bhd were for RM974mil and RM764mil respectively, indicating that the RM500mil figure could be on the low side. There are also contracts for stations and depots. And the single biggest one will be for tunnelling works for the 9.5km underground portion of the Sungai Buloh-Kajang MRT line. The bill for this is estimated at 40% of the total project cost, which is estimated at RM30bil. The first line stretches 51km. “The positive news from MRT Co reinforces our positive view on the construction sector as we expect a lot of sizeable projects to be awarded this year,” wrote MIDF Research in a recent note. OSK Research said that if it did turn positive on the Malaysia market, construction would be one of the sectors it would be bullish about. But are the contracts being farmed out too hurriedly? And what assurance is there that the right parties are winning the awards? These are valid concerns, considering that Malaysia has a questionable track record when it comes to the building of large infrastructure projects in terms of contractors' ability to deliver the goods in time and within budget. In the past, a massive amount of money had been spent by the Government in bailing out the two light rapid transit (LRT) operators and the monorail project. But MRT Co CEO Datuk Azhar Abdul Hamid explains that the plan to get these contracts awarded by April is to ensure that the MRT (since renamed Klang Valley MY Rapid Transit or KVMRT) isn't delayed. “We are already about six months behind schedule and also want to make sure we can deliver the project ahead of the expected completion time in July 2017. There is nothing wrong to speed things up as we do not rely on one company to do the work and that's why we are spreading it out. The most important thing is coordination and supervision,” he says. Azhar explains that a rigorous process is involved in deciding which companies are awarded with the contracts. In fact, the selection process dates back to even before Azhar, the former head of Sime Darby's plantation division, was made chief executive of MRT Co last August. Syarikat Prasarana Negara Bhd (Prasarana) which was first tasked with managing the KVMRT project, had earlier called for parties to express their interest in participating in the works for the KVMRT. That was back in 2010 and by September 2011, Prasarana had decided on the “pre-qualification” list for all the different packages involved in building the KVMRT. According to Azhar, the bids which are then submitted by the pre-qualified contractors are first evaluated by a working committee chaired by both MRT Co and the Project Delivery Partner (PDP) to gauge applicants' technical and financial capabilities. One unique feature of the KVMRT project is the presence of the PDP. In late 2010, a Gamuda-MMC consortium, who had first pitched a plan of the MRT to the Government in the early part of that year, had been appointed as PDP consultants for the MRT project. The PDP bear certain management risks in this project and are therefore key stakeholders in the KVMRT. Hence it has a say in the decision-making process of contract awards. From there, the applications go on to a one-stop technical committee chaired by Azhar. The chairpersons include Finance Ministry secretary-general for contracts up to RM50mil; the Second Finance Minister (up to RM300mil) and the Prime Minister for contracts worth more than RM300mil. Azhar adds that in cases where there are cost overruns, it is only to be expected that the PDP will also be penalised for that. “In the case of variation orders, we will only look at very exceptional cases,” Azhar says. Aside from the PDP, there's also the role of the independent consulting engineer or ICE. It has been reported that Prasarana had already issued a letter of intent to engineering firm HSS Integrated Sdn Bhd in a JV with SNC Lavalin (of Canada) to take on the role of ICE. HSSI was previously involved in the design, construction and supervision of the KL International Airport, the Light Rail Transit System 2, the North-South Expressway, Maju Expressway and the Express Rail Link. Azhar says the role of the ICE is crucial as it will monitor the progress of the project and its input is needed before contractors are paid. It is also tasked with safety aspects of the project. Still on the issue of the PDP, recall that the appointment of Gamuda-MMC as the PDP for the KVMRT project had caused some controversy, considering that they are also bidding for the tunnelling portion, which is single biggest contract in building the MRT. Azhar explains that it is Gamuda and MMC who has first come up with the MRT proposal to the Government and they have from the start indicated their keenness to be involved in the tunnelling portion of the project. “To ensure proper due diligence and that the Government is getting the right pricing for the tunnelling portion, that's the basis of having the Swiss Challenge method for picking the tunnelling contractor,” Azhar says. To date, five groups of companies, including the Gamuda-MMC JV, have been shortlisted for the tunnelling job. If Gamuda-MMC wins the tunnelling job, it would step out of the PDP role relating to that part of the project. Under the Swiss Challenge system, MMC-Gamuda will have the first right of refusal to do the job at the lowest bid plus a small 2.5% to 7.5% margin. Curiously, this has not stopped other parties from making a bid. “Take note that the other bidders for the tunneling job are made up of two Chinese, one South Korean and one Japanese company. Aren't they also able to have advantages of economies of scale and possibly government funding on their part?” Azhar notes. Azhar says that it will be Dana Infra that will be raising the bonds. It has been reported that a special unit of the Finance Ministry called Dana Infra Nasional Bhd (Dana Infra) has been set up to issue bonds to raise the financing for the MRT building cost. Checks with Government sources reveal that Dana Infra is headed by Fazlur Rahman Ebrahim, who is the current managing director of Prokhas Sdn Bhd, itself a unit of MoF that was set up in 2006 to manage the residual assets of Danaharta. Fazlur has yet to respond to queries from StarBizWeek on the planned bond issuance. Sources, however, have indicated that these bonds would be fully government-backed. It had also been reported that while the MRT was not going to be profitable, there would be a strong focus to reduce its cost and this was where a “rail plus property” plan had been cited before, where some level of real estate development would be emarked on to recoup some of the losses from the MRT. Another non-fair revenues would be sought such as from advertising. StarBizWeek had previously quoted economist Dr Yeah Kim Leng of RAM Holdings, who opined that assuming RM30bil is raised by the Government via bonds to the fund the MRT, it will raise the Government debt-to-GDP ratio by 3.9 percentage points to 57% based on the 2010 gross domestic product (GDP) figure. He said when compared with the debt situation of many advanced economies where the debt levels are either close to or above 100% of GDP, the Government does have the borrowing capacity. He had also said that the bond issuance of RM30bil would raise the fiscal deficit by an estimated 0.2% of GDP which “may necessitate either a cut-back in spending on other areas or raising revenue through means such as asset sales or tax increases, in order to achieve the fiscal deficit target of less than 3% of GDP by 2015,” he reportedly said. On a positive note, Yeah had added that the MRT project would “boost the economy by adding jobs and crowding-in investment which would have the desired effect of enlarging the GDP, thereby contributing to either stabilising or lowering the debt-to-GDP ratio”. The KVMRT though, is going ahead and Azhar is winning the battle with the majority of land owners having inked agreements to facilitate the MRT allignment. “A lot of efforts are being made on our part to do this correctly. We will get there,” he ethuses and is hopeful that the July 2017 target for the first line of the KVMRT would be achieved. DESPITE the global economic uncertainty, the Master Builders Association Malaysia (MBAM) is bullish about the growth of the local construction industry in 2012. The Malaysian construction industry is expected to grow to RM92bil this year from RM85bil last year,” says MBAM president Kwan Foh Kwai. “However, with the uncertainty of the global economy and the expectation that the property sector may be less robust, MBAM is cautiously optimistic that the construction industry outlook for 2012 will be relatively stable, backed by the continued implementation of projects under the 10th Malaysia Plan (10MP) and the Entry Point Projects (EPP) under the Economic Transformation Programme (ETP),” he adds. Kwan says the timely awards and implementation of projects under the 10MP and ETP will contribute positively to the growth in 2012, as the projects requires a gestation period to generate impact to the economy. “A continued conducive environment for doing business in the country, clear guidelines and timelines for approval processes and a level playing field will definitely help spur growth and investment in Malaysia. “This planned and progressive awarding of projects will reduce any abrupt increase in demand for building materials and manpower, which may jeopardise the targeted growth due to temporary shortages in supply. This will also prevent unnecessary price increases which will add burden to contractors,” he says. Analysts, meanwhile, are pretty upbeat about the outlook for the construction sector, in light of the call for tenders of the Klang Valley My Rapid Transit (MRT) jobs by MRT Co.
Last month, it was reported that MRT Co is expected to call for tenders of MRT jobs that comprise 18 elevated civil, station and depot work packages under Phase 1 worth RM15bil. Phase 1 involves 20 km between Maluri and Kajang. Meanwhile, tenders for Phase 2 of the MRT project will be called in the second half of 2012, which the market values at RM15bil. “The positive news from MRT Co reinforces our view on the construction sector as we expect a lot of sizeable projects to be awarded this year, especially in the second half of 2012,” says MIDF Research in a report. An analyst from a local bank-backed brokerage says the new MRT jobs will bode well for the construction industry this year. “It will create some excitement for the industry and spur spin-off jobs, which will benefit the local construction sector,” he says. Kwan notes that the Government has targeted a 7% growth for the construction industry this year. Kwan believes that the Government’s public-private partnership business model will play an integral role in the development of the local construction industry. “There is also a need to bring in foreign direct investments (FDIs) which will definitely play an important part to promote construction growth in 2012. “MBAM opines that boosting investors’ confidence and sentiment with measures aimed at enhancing economic efficiency through market liberalisation and lowering business costs will help add to the country’s FDI growth momentum in 2012,” he adds. Kwan says the MBAM has urged the Government to speed up the award of new projects, especially those with that would have a high impact to the economy in 2012. “For projects involving FDI and domestic investors, the timely issue of construction permits will further improve confidence of investors. Other issues the MBAM feels could present challenges to the local construction industry, says Kwan, include the stability of building material prices, policy and law related matters, aside from high import duties for construction heavy machinery. Kwan says having sufficient and skilled workforce for the sector is also vital. The MBAM has appealed to the Government to lift the temporary suspension for workers’ quota application, saying that the construction industry is currently facing a shortage of manpower. Kwan says there is currently a critical need to replenish the pool of skilled construction manpower. Kwan says MBAM is also collaborating with the KLIA Professional and Management College and conduct the MBAM Site Safety and Health Supervisors (SSS) training course, which is accredited by the Department of Safety and Health and help address the shortage of SSS in the construction industry. The kickoff of the country's largest infrastructure project the Klang Valley My Rapid Transit (KVMRT) could spark re-ratings across several sectors starting with the construction sector which is the direct beneficiary. A flurry of construction jobs which would swell up the order books of companies by leaps and bounds, is expected to be announced over the next six months as the multi-billion MRT development, which is six months behind schedule, strives to play catch up. To kick-start, MRT Co has appointed IJM Corp Bhd (IJM) and Ahmad Zaki Resources Bhd (AZRB) for the construction of viaduct guideways and other associated works. MRT Co is the project and asset owner of the MRT. The two separate multi-million contracts at RM974mil and RM764mil for IJM and AZRB respectively are part of eight complete packages in the elevated civil works portion one of the largest portions of the MRT project. There are a total of 90 work packages for the entire first MRT line, providing ample jobs for virtually everyone in the consruction industry and including those in building materials and property. MRT Co chief executive officer Datuk Azhar Abdul Hamid says six more of the eight major packages are expected to be awarded within the next six months. 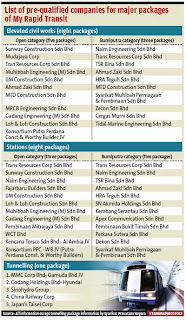 Of the eight, five will be from the open tender category while three contractors will come from the bumiputra category. “It should be a fast process as we already have a pre-qualified list,” he says. While the margins of contractors cannot be predicted, analysts have said that technically, margins for MRT works should be higher than the 5% earned by contractors who worked on the light rail transit or LRT system given the higher complexities and financial risks of the former. Among those on the pre-qualified list for the elevated civil works portion, analysts have singled out a few companies which are likely beneficiaries based on several factors. One of this is Naim Engineering Sdn Bhd, a wholly-owned unit of Sarawak's largest property developer and construction firm Naim Holdings Bhd. Reports point out that Naim's construction and engineering arm has a track record of completing more than RM2.7bil worth of projects either on time or earlier and within budget. This should augur well for the company since the ability to stick to a strict timeline and within stipulated costs is vital in a mega project like the MRT. Naim has experience in projects involving road, bridges and buildings for both the Government and private sector. It is also a pre-qualified candidate in all of the elevated works portion of the project including civil, stations and depot jobs as well as being represented both in the open and bumiputra tender categories. Besides Naim, AmResearch construction analyst Mak Hoy Ken says for the remaining six elevated civil work packages, he likes IJM, Sunway Holdings Bhd and Malaysian Resources Corp Bhd as possible contenders, for their solid track records in delivering major construction and property projects. HwangDBS Vickers Research chooses IJM, Sunway, Muhibbah Engineering (M) Bhd and TRC Synergy Bhd as possible recipients, all of which have been pre-qualified for all elevated works including civil, depots and stations. Azhar says that he does not rule out the possibility of IJM and AZRB being awarded with contracts again despite being the chosen ones in the first round. “There is a possibility, yes,” he tells StarBizWeek. On the tunnelling portion - which is the single largest portion of the MRT project valued at about RM8bil, HwangDBS says it is optimistic that the MMC Corp Bhd-Gamuda Bhd joint venture would win the bid despite stiff competition including from foreign parties. The result of this should be known by April. “Conventional wisdom suggests it is best to keep this MRT project domestic with a stronger multiplier effect on the economy, especially with possibly slower gross domestic product growth in 2012,” the research house says. Gamuda is jointly appointed with MMC as the project delivery partner for the entire MRT project. Additionally, the joint-venture is the only pure local party with bumiputra interest, and therefore would be accorded a 7.5% tender pricing advantage; it also has an edge over its competitors in terms of having better understanding of Malaysia's soil conditions and experience in completing the SMART Tunnel. As for the initial spillover to other parts of the economy, AmResearch's Mak says the imminent roll-out of MRT jobs is expected to first prod renewed focus on building material players. “Our initial checks indicate that the Sungai Buloh-Kajang line alone may require 500,000 tonnes of steel, with the maiden orders likely to kick-in by the end of the first half of this year. “This should benefit Ann Joo Resources Bhd and Lion Industries Corp Bhd, both in steel and Lafarge Malayan Cement,” he says. The Sungai Buloh-Kajang line is the first line out of three under the entire MRT plan. According to MRT Co, line two, the circle line (MRT 2) and line three (MRT 3) should be completed by 2020 and are expected to cover the regions of Kuala Lumpur and the north-west corridor of Greater Klang Valley which includes linking Sungai Buloh, Kepong and Selayang with the eastern half of the city centre (including Kampung Baru and the Kuala Lumpur International Financial District). With such a strong pipeline of multi-million projects just waiting to flow into the order books of the local boys, there remains the huge cloud of political risk with the impending general election. Needless to say, disruptions in political conditions could derail or delay the take-off of any national infrastructure project. Profit-wise, the earnings impact of the jobs on companies' balance sheets are not expected to be meaningful until at least in two years' time when the project should be in full swing. Even then, JF Apex Securities Bhd deputy managing director Lim Teck Seng warns that profits gained by companies involved may not be within expectations. “Swelling order books and actually making money from that are two separate things. “Most of the jobs will be awarded to companies which offer the lowest price, so if related costs arising from inflationary pressure go up beyond their expectations, the companies may even end up making losses,” he says. Vincent Khoo, head of research UOB Kay Hian (M) Holdings Sdn Bhd points out that in terms of stock prices, a lot of the good MRT news have already been priced in especially when it comes to the big boys of the sector. “Hence, valuations may be a little lofty taking into account external uncertainties, upside could be limited but downside significant, if there are delays in dishing out of contracts,” he says. MRT Co, is expected to make public the list of all the works for the Sungai Buloh-Kajang MRT line very soon with most of the big packages being awarded this year and the smaller ones in the early part of next year. For now, OSK Research Sdn Bhd is maintaining a “neutral” call on the construction sector. “We do not discount a potential re-rating on the sector in the near future, pending more concrete signals,” it says.